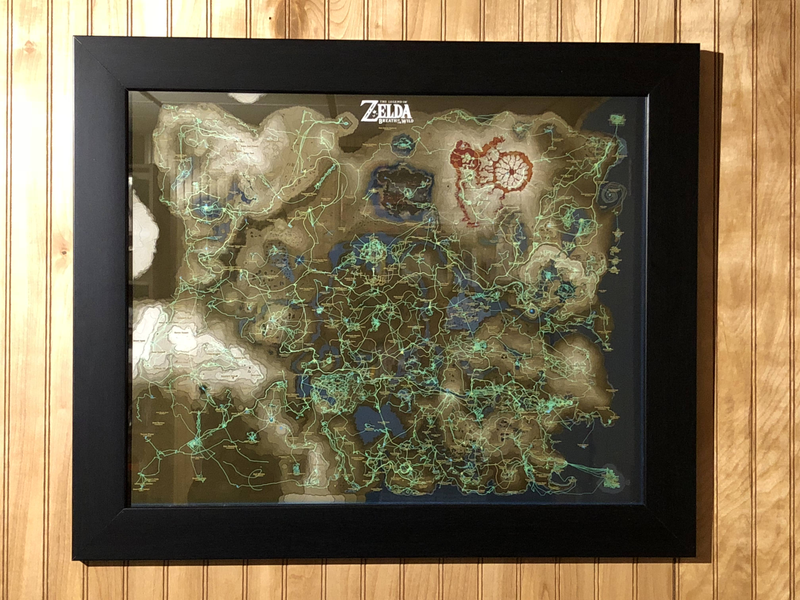 Since its first DLC, The Legend of Zelda: Breath of the Wild has given players the option to look back at all the places they’ve traveled by showing their path in green, known in the game as the “Hero’s Path.” While the feature has always been neat, it looks even more unique and intimate when turned into a real-life work of art. A Zelda player whose name is Andrew Czudak did just that and recently shared the results on Imgur. Taking over 200 screenshots of their overworld map using the Switch’s in-game camera, they were able to compile a pretty zoomed-out and high resolution encapsulation of all the time they and their partner spent with the game. Creating the work required painstakingly scrolling across every section of their Hero’s Path with the analog stick and then cropping and re-cutting the resulting screencaps in Photoshop to line them all up. The point of this complex method, rather than just blowing up a single screenshot of the entire thing, was to get more detail. The resulting image ended up being 5842x4868, which was then printed out at 16x20 and 300 dpi. Having an actual physical object takes these personal insights and memories adds a kind of permanency to them. It’s sort of like preserving a playthrough in amber. Even if Czudak and his partner eventually lose their Zelda data because the Switch doesn’t have cloud saves, at least they’ll always have a beautiful map.